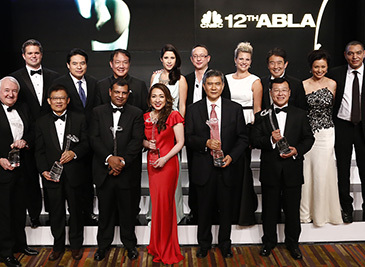 Bangkok, Nov. 14, — CNBC, First in Business Worldwide, pioneered the Asia Business Leaders Awards (ABLA) to acknowledge exceptional CEOs across the region. Recipients of the awards are stellar individuals who are visionaries behind today’s outstanding businesses. They epitomize core values of a successful leader - strength, innovation, ingenuity, knowledge and foresight – values that are imperative to carving out powerful businesses in the global economy. During an award ceremony that was held this evening at the Conrad Hotel in Bangkok and hosted by CNBC’s Bernard Lo, Martin Soong, Christine Tan and Deirdre Wang Morris, CNBC announced the winners of the 12th Asia Business Leaders Awards. Asia Business Leader of the Year Award – Mr. Tan Pheng Hock of Singapore Technologies Engineering Ltd. for adopting a customer-centric culture and embracing a framework that motivates and inspires staff, making his vision for the company a reality. Asia Innovator of the Year Award – Tan Sri Dr. Tony Fernandes of AirAsia Berhad for his belief that innovation is not limited to technology, but should be brought to every aspect of the business - creating an environment for innovation throughout the company. Asia Talent Management Award – Mr. Yancey Hai of Delta Electronics Inc. for his personal involvement in supporting and cultivating the next generation of leaders. Corporate Social Responsibility Award – Dato’ Rohana Binti Tan Sri Datuk Haji Rozhan of Astro Malaysia Holdings Berhad in recognition of her devotion to educational, environmental and societal issues, and integrating social responsibility into business objectives. Lifetime Achievement Award – Mr. Ratan N Tata for his vision, leadership and business foresight in transforming a group that has impacted and helped grow the economy not only in India, but across the globe. Thailand Business Leader of the Year Award – Dr. Pailin Chuchottaworn of PTT Public Company Ltd. in recognition of his visionary leadership in both his home country and in the global marketplace. The 12th ABLA will be broadcast globally in Asia, Europe and the U.S on November 28, 2013 @ 8pm (SIN/HK).